The nature of language, and, in particular, its limitations as a method of expressing deep and difficult feelings, informs much of my work. I work directly with books, texts and paper ephemera to create drawings, installations and sculptures that pose questions rather than deliver answers about how we communicate within our familial and intimate relationships. There is an intensity to the work – more akin to writing than drawing – involving a painstaking re-piecing together of texts that offer alternative meanings, narratives and contexts that question the role of language within emotive scenarios. The physicality of the books, the printed surface of the page and the design of the texts play an important role in the making of my work, as does the serendipity involved in the ‘finding’ of them – the musty smell, the grainy texture of the paper, the inconsistent heaviness of some of the type and the dated graphics of the book covers all play their part in seducing me into working with them. My work is pared down, seemingly simple. Some pieces involve a re-making of dictionary pages, where I focus on a particular word and expand upon its general definition by creating a stream of consciousness narrative that challenges the limitations of its given understanding. Other works feature figurative templates that contain text or other ephemera, such as stamps or fragments of book or magazine illustrations, through which memories are triggered or associations made. However, as with all drawings, the negative space plays an essential part in the understanding and reading of the pieces. The words and images in these pieces are animated, three-dimensional; they either jut off the page - casting rows of sharp, urgent tick-like shadows - or they undulate, forming an active, physical representation of speech, becoming tangible artefacts of intimate conversations. Ellen Bell is an artist based in Wales. Her drawings, installations and sculptures are informed by ideas surrounding intimate communication through the written and spoken word. Bell interacts with found books, paper texts and other ephemera making three-dimensional narrative pieces that seek to subtly challenge our understanding of what is, and is not, possible when using language to communicate complex feelings. Bell's work has been shown in many solo and group exhibitions and has featured in various notable national and international art fairs such as COLLECT at the Victoria & Albert Museum and SOFA in Chicago. Bell also produces site-specific work for public art projects, including her critically acclaimed installation piece, Speaking Soul, at the City Gallery in Leicester in 2007. In 2002 the Victoria & Albert Museum purchased a piece for their print collection. In September 2013, Bell is due to begin an MA in Creative Writing at Aberystwyth University. 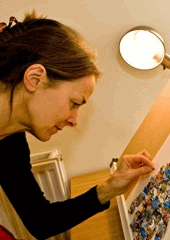 Since 2002, Bell has been a visiting artist and lecturer at various art schools and colleges across the UK.